Was there ever a time that flying the skies was truly friendly? Nowadays, you just try to cling to your seat until take off, praying you won’t get boot-stomped for wearing leggings in the aisle. A Houston mom named Mei Rui is the newest alleged victim of an airline’s naked hostility towards its customers. 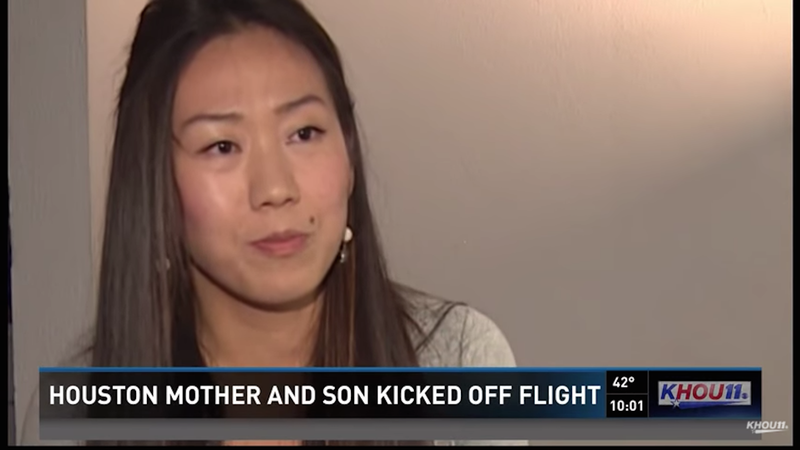 She claims that on Friday she was kicked off a Spirit Airlines flight because her baby was crying. The Washington Post reports that Rui was traveling with her elderly parents and 2-year-old son from Houston to New York. In addition to being a concert pianist, Rui has degrees in molecular biophysics and biochemistry, a Grammy nomination, and is a cancer researcher. All this and she still managed to make it to a flight scheduled to leave at 6:30 am, so she could participate in a recording related to a cancer study in New York. When the flight was delayed due to weather, her son became restless, so she decided to breastfeed him, hoping he’d fall asleep by the time the airplane’s door closed. But the airline representative declined to give more details. “If this happened to your family.” Rui said. Look, I hate crying babies on an airplane, but they are tiny humans who occasionally need to be transferred from one place to another. Deal with it. The stress of the day wasn’t over either. Their baggage was not returned, and when they finally got back to their home, Rui’s father collapsed and had to be rushed to the hospital. Rui missed her chance to participate in the cancer study. There is no amount of good or hard work you can do that will protect you from the capricious wardens of the sky.